Today I'm here to show you my inspirational work for the monthly challenge at Copic Spain. Our theme this month is Anything Goes with Copic and our sponsor Zuri Artsy Craftsy and her beautiful sweet images. List of materials and colouring details can be found in here. Wow this is Beautiful creation Aurora, wonderfully done and great design! Thank you for joining us at Come And Get It this week. Hope to see you back here again soon. 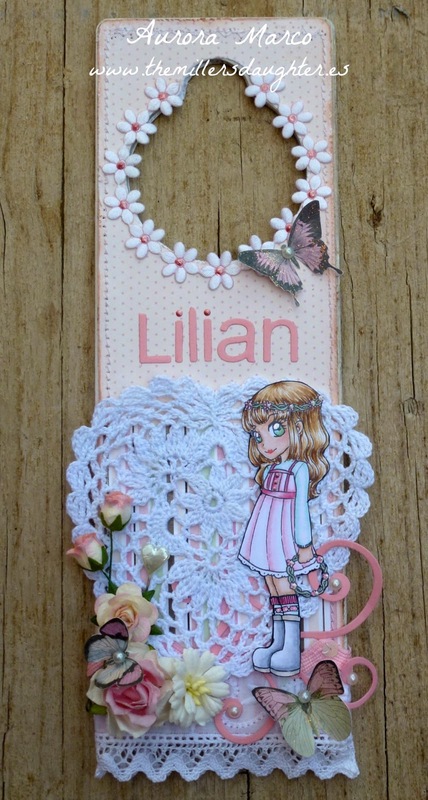 Such a sweet door hanger, lovely soft colours beautifully done. Thanks so much for joining us over at Emerald Faeries Challenge Blog, good luck and hope to see you again. Another lovely creation. It looks wonderful too. Lovely colouring. Thanks for joining us here at the Paper Shelter this week. Gorgeous card. love the image. Thank you for joining use at TPS. It's always fun to see something else but a card, and what a gorgeous door hanger you have created here! Very sweet image - beautifully decorated. Thanks for linking up to LLC's wings-challenge.